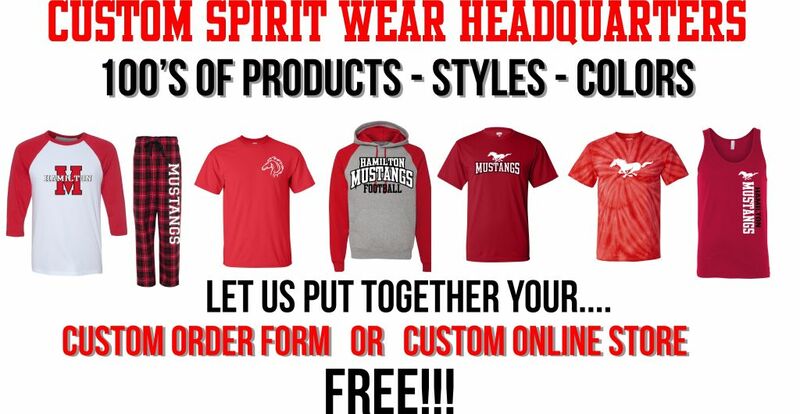 Order custom spirit wear with free online store or order form. If you are in the market for spirit wear you’ve come to the right place at Kirkwood Trading Company where we are your custom spirit wear headquarters. We provide custom spirit wear for team sports, high schools, grade schools, catholic schools, club sports, and even businesses. Since we carry a full line of apparel products we have something for everyone and we can print a full line of gear for all of your needs for all seasons. If you have a logo or design, great! If not we can help you with designs at no charge. In addition we can prepare order forms and even provide you with your very own online store free of charge as well. Some organizations offer spirit wear just to their people can show their pride. Others use their spirit wear to raise money. Whatever your cause we have a solution to work with you on your orders and make them succesfful. Your custom spirit wear headquarters couldn’t be easier to work with and the best part is when it comes to the free online stores, there is absolutely no money out of pocket. If you have never ventured into the spirit wear arena and need help with what sells we can provide you with the most popular items and even graphics that are sure to be big sellers. We operate our spirit wear production in the most efficient way possible so that everyone who orders your stuff gets their apparel at the same time in a timely manner. Depending on the quantities and styles and how many different apparel options you offer, the turn around will still be inside two weeks time. Some places want to offer shirts only while others want to offer hats, shirts, sweatshirts, blankets, stadium chairs, pajama pants, etc. The more items you offer the longer the production but with your custom spirit wear headquarters you are still talking inside two weeks to recive the entire completed order. Contat Kirkwood Trading Company and we’ll be happy to speak with you about your spirit wear and how we can provide you with the best custom apparel possible for the best price.